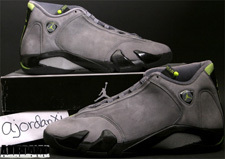 The Air Jordan XIV was retroed for the first time in 2005. On September 24th, seven years ago, the first two colorways were released. Click here to grab a pair on eBay. A part of the Jordan Brand LS (lifestyle) collection which featured unique colorways with matching apparel released alongside them giving you the ultimate hookup. This is the "Chartreuse" Pack featuring two new colorways of the Air Jordan XIV, both originally retroed in 2005. The light graphite-based colorway features a suede upper with chartreuse and black accents while the white-based colorway features a leather upper with chartreuse and black accents. 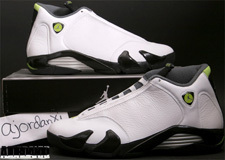 The white-based pair is the closest we have gotten to the original "Oxidized Green" colorway of the Air Jordan XIV which to this date has yet to be retroed. Since these two colorways released, the Air Jordan 14 Retro has been released in numerous colorways in 2005 as well as 2006, 2008, 2011 and 2012. The Air Jordan XIV is one of my personal favorites in the Air Jordan line and, both of these colorways were on point. Enjoy the images below of my pairs as we take a new look at them, seven years after their release. If you're looking to grab a pair of these, click here to grab them on eBay.